Earlier this year at Anime Expo, Studio Trigger announced that they would be collaborating with A-1 Pictures on a new science fiction anime show, DARLING in the FRANXX. Studio Trigger are best known for their shows Kill la Kill and Little Witch Academia, while A-1 Pictures is the studio behind The IDOLM@STER series. While little is known about the show a new teaser video was released showcasing the feminine shaped robot “FRANXX”. What we do know about this original sci-fi anime is that it features two characters that are “children without names”: Code: 016 and Code: 002. The text that is associated with each character in the teaser videos are blue for Code: 016, and red for Code: 002. In the most recent of the two trailers the blue text reads “But we were born only to pilot the FRANXX” while the red reads, “Will you escape? 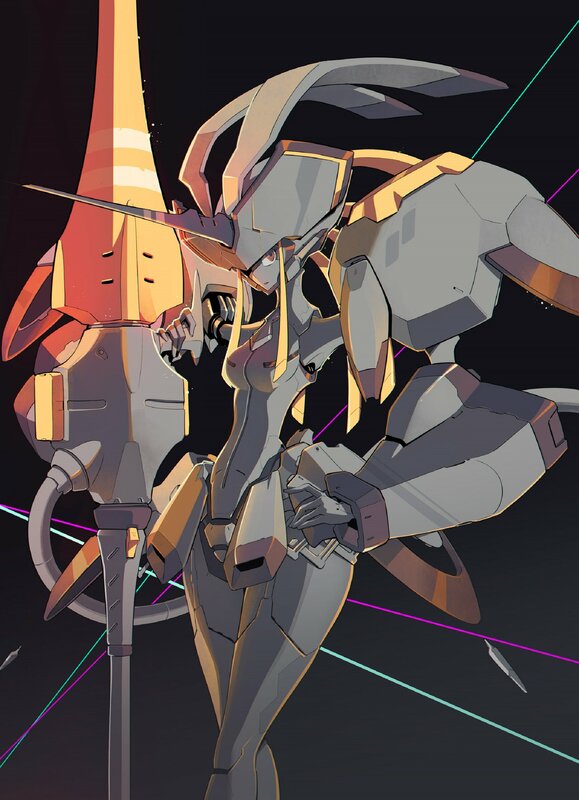 With me.” What little we know about the robot FRANXX is that it is referred to as a “steel maiden”, it is pilotable, and it is some form of weapon. If you would like to learn more about the shows that Studio Trigger announced at Anime Expo this year, Too Far Gone has info on all three.